Loss and degradation of habitat is a major cause of decline and extinction of species in Australia. The scale of degradation poses many challenges to recovery efforts. Landscape restoration aims to conserve biodiversity, to regain ecological integrity and assist with recovery of degraded ecosystems by focusing on restoring ecological processes to achieve this. In this issue we will focus on the restoration of larger areas. We want to look at the practical on-ground works being undertaken. What tools did you use to assess the state of the site and what approach did you take in restoring it? What challenges were encountered and what were the outcomes? If you are intending to submit an article or wish to discuss possibilities, please contact the Editor, Selga Harrington, by 20 July Your final article must be submitted to Selga by email at selga.harrington@gmail.com. 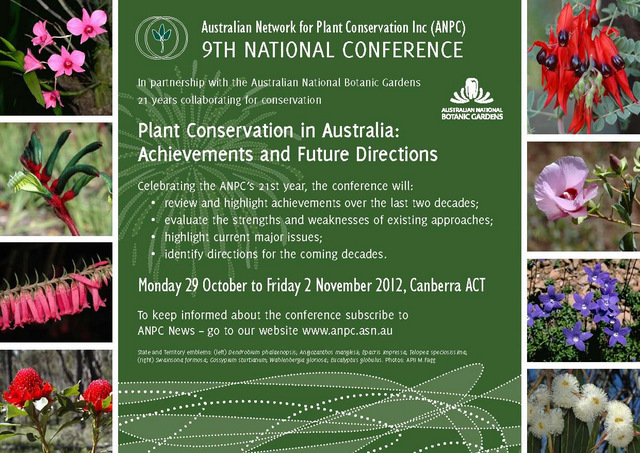 Registration is open for ANPC’s 9th National Conference to be held 29 October – 2 November 2012 in Canberra. The conference will be relevant for the full range of people and groups involved in plant conservation in Australia and will provide a significant networking opportunity for participants. There’s still plenty of time to register in time for the early bird discount which ends 24 August 2012. Abstracts are invited for conference presentations, posters and workshops. Abstracts should address a theme of the conference. Closing date for abstract submission is 17 August 2012. Wales has become the first country in the world to DNA barcode all its flowering plants, enabling scientists to explore new ground breaking health and conservation research. The project, led by the National Botanic Garden’s head of conservation and research, Dr Natasha de Vere, has created a reference database of DNA barcodes based on the 1,143 native flowering plants and conifers of Wales. It means that for the first time, plants can be identified from pollen grains, fragments of seed or roots, wood, dung, stomach contents or environmental samples collected from the air, soil or water. “Wales is now in the unique position of being able to identify plant species from materials which in the past would have been incredibly difficult or impossible,” Dr de Vere said. The Welsh flora DNA barcodes have already been made freely available on the Barcode of Life Database where researchers throughout the world can access the information for their own research purposes. The Invasive Species Council has launched a proposal for a national biosecurity taskforce, with the working title ‘Environment Health Australia’. The proposal forms the bulk of a new ISC report, ‘Keeping Nature Safe’. The concept builds on assessments in Australia’s 2011 State of the Environment report that Government responses to invasive species are “uncoordinated at the national level, reactive, focused on larger animals, biased towards potential impact on primary industry at the expense of the total ecosystem, and critically under-resourced”. Improve coordination and collaboration between jurisdictions, agencies and sectors. The Invasive Species Council is an environmental NGO that campaigns for stronger laws, policies and programs to protect Australian biodiversity from invasive species. Threatened flora species in danger of extinction were planted across Western Australia during May as part of an annual Department of Environment and Conservation (DEC) project to collect rare seeds and plant them in the wild. DEC research scientist Leonie Monks said 15 critically endangered plant species were being targeted as part of the translocation project. “Translocations have been carried out by DEC for nearly 60 plant species over the past 17 years, but with 137 critically endangered species in Western Australia there is plenty of work still to do to prevent extinctions.” she said. Ms Monks said translocating rare species could be extremely challenging.“Some of these species consist of just a handful of individuals in the wild, so in many cases it takes several years before there are enough seeds in storage for us to be able to attempt the translocation, and even then the seedlings may not survive,” she said. “In other cases we are more successful, such as for Grevillea calliantha, which we are planting and monitoring near Cataby. We planted 177 seedlings in 2010, 74 of which have survived, and we are about to plant a further 102 seedlings. Leonie Monks will be providing an overview of lessons learnt from Western Australian flora translocations at an ANPC workshop on the translocation of threatened flora in Sydney 6th November 2012. NSW Office of Environment and Heritage (OEH) Senior Threatened Species Officer Rainer Rehwinkel was delighted with the efforts of everyone who planted endangered Aromatic Peppercress at Mcleods Creek Nature Reserve in late April. Mr Rehwinkel said seedlings were planted in weather perfect for the plants but not as comfortable for the volunteers and staff from OEH, CSIRO, and the Australian National Botanic Gardens (ANBG). “Twenty of us worked in rain, hail, chill and occasional sunshine without complaint and we successfully planted 360 Lepidium hyssopifolium seedlings grown at a Bathurst nursery. “On the advice of ecologists Sue McIntyre and the OEH’s John Briggs, we planted in both grasslands and the grassy woodlands at the reserve, and we will now monitor their success. “This planting may be critical to the survival of Aromatic peppercress, which was once common in eastern Australia, but there are now only two known natural populations, both in NSW,” Mr Rehwinkel said. 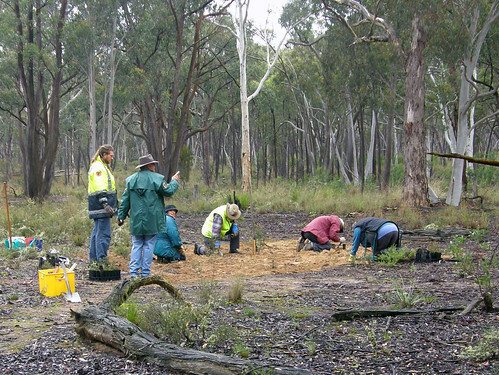 Research by the Department of Sustainability and Environment’s Arthur Rylah Institute (ARI) has shown the Mallee woodlands in North-west Victoria are blooming due to a combination of good rainfall and 20 years of pest control work. “Years of Parks Victoria work managing grazing animals means the good seasons have had a significant impact on a lot of Mallee plant species and some of those benefits will be long term,” Dr Cheal said. Public consultation has opened for the next phase of Caring for our Country. Consultation will run until 15 August and will include stakeholder forums and meetings and the release of discussion papers through a dedicated online forum. The consultation will focus on specific areas of program implementation that are still to be developed. For information and to contribute visit www.caringforourcountryreview.com.au. Draft Strategic Plans have been prepared for three of the 12 recently declared additional Weeds of National Significance (WoNS). Comments close 16 July 2012. The Federal environment department is assessing the Lowland Grassy Woodland and Derived Grassland of the South East Corner Bioregion for potential listing as a threatened ecological community under the Environment Protection and Biodiversity Conservation Act 1999 (EPBC Act). Comments close on Friday 17th August 2012. A discussion paper on managing native grasslands been released as part of public consultation for the review of the Native Vegetation Regulation. This is the final consultation document for this stage of the review. Regional information sessions are currently happening across NSW. Submissions to the review are due by midnight 24 August 2012. The Noxious Weeds Briefing Paper by Daniel Montoya provides an overview of noxious weeds in New South Wales and includes discussion of weed classifications; their impacts; NSW legislation and legislative reforms; and policy and administrative frameworks and their relationship to the Australian Weed Strategy and biosecurity. After 16 months as chief Climate Change Commissioner Tim Flannery made 16 visits to regional Australia to engage with the community about climate change. What he learned was unexpected, and very different from what you read in the media. Further details for this free seminar can be found here. Hosted by the Horticultural Media association of NSW, this seminar will provide a briefing on plans by the Australian Institute of Landscape Architects to improve the specifications for soil supplies and on how the new Australian Standard (AS4454) for composts, soil conditioners and mulches has resulted in significant changes that will impact on the entire landscape supply change. While climate change, ocean acidification and biodiversity loss dominate news headlines, why does the topic of soil security, the maintenance or improvement of the world's soil resource, rarely rate a mention? A forum of University of Sydney academics working in agricultural research, along with international experts in soil science and security, discuss their latest research findings along with real world implications. More information on this free seminar available here. Early bird conference registrations are now open for the National Landcare Conference to be held at the Sydney Convention and Exhibition Centre from 3 - 5 September 2012. Got some plant conservation news that could be of interest to the readers of ANPC News?